Scarlets Hotel Blackpool. Located at 87 Lord Street FY12DG, . www.scarletshotel.co.uk Telephone 01253 317640. PLEASE NOTE: Scarlets has new owners and is no longer a dedicated cross dressers hotel. UK Tights - UK Tights was formed in September 2005 and was founded by Dawn Barber and her husband Jonathan. They felt that there was a genuine gap in the market for the supply of good quality hosiery at the right price. We have many male customers, and our staff are only too happy to offer advice. Take a look at our website at www.uktights.com . If you quote 'nconcord' you'll receive a 10% discount on your first order. Curves are in! And I’m sure that you’ll agree with me, that for the first time, plus size fashion is better than ever – for hosiery anyway. Manchester Housing - The basic principles of the service are that the person must identify themselves has LBGT, be over 50 years old, live in the City of Manchester, and must be in occupation of a tenancy ( Council Housing, Housing Association, Part ownership, etc) Of course because of the service everyone's sexuality is kept confidental along with any health needs and in information disclosed to other agencies are on a need to know basis and with full consultation of the service user. Contact Mark Ince who is a Housing Support Worker for LGBT People. Housing Support Services, Manchester City Council, 133 Sandhill Road, Manchester, M9 8JR. Draycott Browne Solicitors, 12 Oxford Court, Manchester, M2 3WQ and at Vantage House, 26a Northenden Road, Sale, M33 3BR . Telephone: 0161 228 2244 - Our website is at www.draycottbrowne.co.uk - To date. we have specialised in criminal law, but have now extended our range of legal services to include private client matters, i.e. conveyancing, probate, etc., and wish to make the transgender community aware of the same. We are able to act for clients all over the UK and plan to carry out surgeries in Manchester Gay Village. The American Dermablend range has been discontinued in the UK and replaced by a new camouflage range produced by Vichy, which uses the same formulation as the original Dermablend. The original product (Brodie & Stone) was available in 15 shades of the 10.7g pack size and 11 shades of the 28.4g pack size. The Vichy Dermablend range contains an initial eight shades (6g). More shades will be introduced next year. Dermablend can be prescribed on an NHS Prescription. But L'Oreal/Vichy have confirmed that they are only supplying this product to pharmacies that are Vichy stockists. The product is not available through the normal wholesaler network and will not be supplied directly to pharmacies that are not Vichy stockists. Patients can contact the Vichy Consumer Advisory Department (0800 169 6193) for details of their nearest Vichy stockist. Vichy will send consumers a starter kit with samples of the new range to help them find a match for their skin, along with a list of stockists. This product was removed from Part XV of the Drug Tariff (the borderline substances list) in December 2005. PSNC has written to Vichy to raise concerns about their decision not to supply non-Vichy stockists. Dermablend Cover Crème Large 28.4g. Just £19.00 including free delivery to your door in the UK. For all your cosmetic needs take a look at our web site. Xsync Digital Photography - Total discretion. Private studio available. PinkKat are Piroska and Gareth the fantastic transgender make over specialists based in Manchester. From 1st August 2004 the pictures will be £19.95.There is NO obligation to purchase. For details of full make over and photo sessions,make up lessons and all the other services offered by PinkKat contact Gareth and Piroska at info@pinkkat.net We look forward to meeting you! Hidden aGender - Let Us Bring the Beauty out from Within - All aspects of beauty, make overs & photo shoots in the privacy of your own home or our Retford based salon, by qualified therapists. Companions for excursions, in and around the Nottingham, Lincoln, & Sheffield area. Be yourself for a day at our Retford based safe home. Pamper days. Storage available. Support & social evenings. Dressing service coming soon. Please Contact Louise (of Tgirl Photography) or Dee at hiddenagender@googlemail.com or phone, Louise on 07890823849 or Dee on 07708300226. Bridgewater Plumbing For discreet plumbing and heating requirements in the Manchester and surrounding areas. Mobile no. 0798 058 3423. Hour Glass Figure An extensive range of breast forms selected specifically for the cross dressing community. Fitting advice available from one of the best bra and breast from fitters in the UK. www.hourglassfigure.co.uk or Tel: 07970 075964." CurvyPads by InShape 'Stick-On' Silicone Hips with micro-tapered edges to blend unnoticeably under clothes. Also available is the CurvyPants to secure the pads and ensure they stay in place all day. See more at www.curvypads.com they are so realistic and comfortable and create THE ULTIMATE HOURGLASS FIGURE!!! Breastforms4u.com - The best Silicones selected from all over the world to suit all Transgender needs by Sue Sheppard with over 14 years experience selling breastforms with FantasyGirl. Shops in Kent and Sussex. 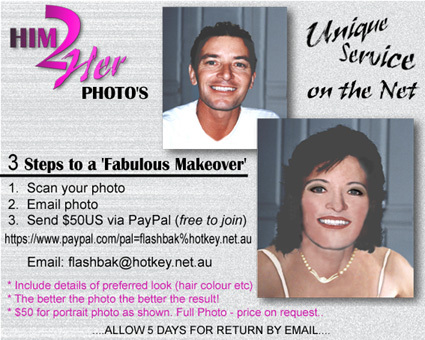 Cross-dressers, TVs - Lady offers escorted shopping trips if you need help or advice choosing clothes and make-up etc. or you're just tired of shopping alone. No time to shop? No problem - personal shopping service also available. For that truly feminine touch and a fun shopping experience, email Crystal at: scherezade31@yahoo.co.uk or phone / text 07788 781181. (Greater Manchester/Cheshire) Looking forward to hearing from you. Get your women's and men's spectacles without embarrassment. Richard prides himself on the best quality of service and value for money on offer. Northern Concord members, showing their Northern Concord membership card will get a full 10% discount off either their men's pair or their fem pair and if they order both they will get a full 20% off the more expensive of the two as well as the 10% off the other pair. This is a genuine discount for current Northern Concord members. Translife - Because we are specialists it does not mean we are expensive! On the contrary you will find our extensive range both compelling and competitively priced. We could list our full range but seeing is believing so visit up at http://www.translife.co.uk and have a little look around. We are more than a shop you will find us friendly and knowledgeable and at hand to help. Janett Scott, 72, Putteridge Road, Stopsley, Luton, Beds. BBC, P.O. Box 210, Belfast, Northern Ireland, BT1 1BG. Made To Measure - Wigs made in the privacy of your own home, usually within 2 hours. I'm a professional hairdresser in the profession for 16 years. I currently work at a hairdressers in Old Trafford, Manchester. I have a extensive knowledge in hair extension and wigs. I make wigs by placing a wig cap on the clients head. Depending on the style and the client head/face shape, hair is placed on the wig cap in the design direction of the head, then secured with hair adesive. This process takes on average about 1hr and 20mins, the hair is then cut and styled according to the clients needs. The Workz - 15 - 15a, Milmor Way, Prestatyn, Denbighshire LL19 7RU. Hairdressers, barbers, Beauty Therapists and suppliers of Quality Wigs at very reasonable prices. You are welcome to come along anytime but if required discreet out-of-hours appointments can be arranged. Tel: 01704 546677 Email: Enquiries@wigsrusltd.com . Trends - Rotherham - Telephone Russ for more information and free catalogue on 0114 276 8676. People mentioning they are from Northern Concord and saw this advert will receive 5% discount in the salon. Very competitive prices! "Strut Your Style" Neece Francess-Allen of Doncaster offering an extensive range of high quality synthetic & real hair wigs, hairpieces & extensions . I also offer a re-styling & re-moulding service which can take your chosen product from being a wig to taking on your personal style and being totally "You" To arrange an appointment (Total discretion provided if desired) please contact me at neecefrancess-allen@live.co.uk. I have recently opened a salon in Doncaster, it's very glamorous and luxurious. I operate by appointment only to enable me to offer total discretion and privacy. Translife - Selecting the correct wig can make all the difference to your appearance and how you feel when dressed. We have a range from some of the worlds leading wig manufacturers - Noriko, Henry Margu and Jon Renau to name but three each design selected with you in mind. For those on a more sensitive budget we have a fantastic range of economy wigs drop in a http://www.translife.co.uk and have a look around. Joseph's Wigs, 24 Rosehill Court, Bishopsford Road, Morden, Surrey, SM4 6JS - We are traditional wig makers by trade; a family business and not just another wig boutique. Our founder Barbara Wells completed her apprenticeship in the 1950's in London when wearing wigs was all the rage. As official suppliers to the NHS, Barbara and her niece Claire are able to advise you on all of the different types of wigs, hairpieces and toupees available. We can offer natural looking acrylic fibre, human hair, monofilament, hand-tied, lace front and machine wefted wigs for all ages. Wiggywigs - We are a manufacturer and vendor of handmade human hair wigs from Poland. All our wigs are made only of Eastern European hair. You can visit our website at www.wiggywigs.com You can have now a really top quality wig made of Eastern European hair for less than half of the price you would pay in the UK. We are a small company and all our products are handmade so one can even send us a photo of a wig of his or her choice and we will make it for you. Can you suggest other names and services we might display as a service to our readers? Are any of the details wrong?